We oppose the 29 COMMONWEALTH AVENUE CLUB and the accompanying increased traffic, noise, and nightlife it will bring to our community. The Haddon Hall Club Proposal includes 356 bar/restaurant seats, rooftop entertainment, hotel rooms open to non-members, and a liquor license. This intersection between Commonwealth and Berkeley is already a bottleneck of traffic cutting through our peaceful residential streets. The community can not bear the noise and traffic burden of a commercial private club attracting hundreds of visitors and their guests, especially after hours and on quiet family weekends. This club belongs elsewhere in the city. The developers have modeled Haddon Hall on the below private clubs. Their high-brow mission statements and their elegant designs are very similar (actual photos from the Caribou Club, Battery Club and Soho House are literally featured in the Haddon Hall proposal- see below). 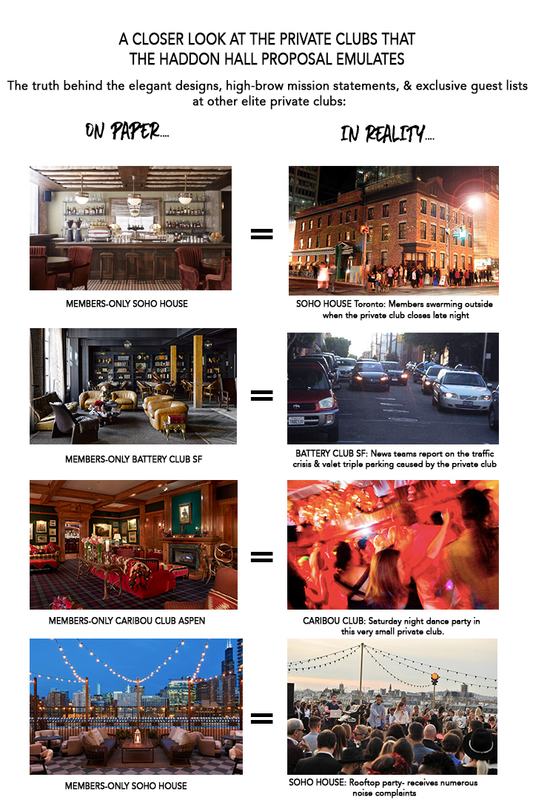 Unfortunately, with all of these private clubs there is quite a disconnect between their culture driven goals and their real world impact: increased traffic, excessive noise, party crowds, disorderly conduct, double-parking (sometimes TRIPLE parking) for valets, delivery mess, drunk guests loitering and smoking outside, and other nuisances.